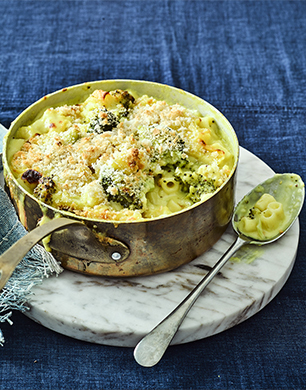 This Mac ’n’ Cheese with healthy veg is made even more scrumptious by a generous dollop of Tracklements Sweet Mustard Ketchup, which adds a tasty tang to an already moreish family favourite. Creamy, delicious and so easy to make, the clever combination of Wholegrain and Smooth Mustards along with a carefully blended selection of spices makes this beautifully gooey main course or snack a delightful dish for sharing (if you absolutely have to!). For extra pizazz, simply drizzle a little more of the Sweet Mustard Ketchup over your own serving – test it first though people! Cook pasta in slightly salted water, reducing the cook time stated on the pack by 5 mins. Add the broccoli about 3 mins before the end of the reduced cook time. Reserve half a mug of the hot water before draining the pasta. Put the pasta into an oven-proof dish. Melt butter in a pan, stir in flour, add the milk and continue stirring until the sauce is smooth and thick. Cook for at least 4/5 mins. Stir in the Cheddar until melted and then add the Sweet Mustard Ketchup and the reserved pasta water. Season to taste. Pour the sauce over the cooked, drained pasta and broccoli, sprinkle with the breadcrumbs and bake in the oven for 25-30 mins until bubbling, crisp and golden.